The app-enabled Bluetooth powered guitar pick that makes everyone musical. Simply power up, connect to the free AirJamz Music apps and strum, shake or move. With AirJamz, everyone can rock! AirJamz Airaoke offers a karaoke-like experience where you can jam with your favorite iTunes songs using the musical instrument that anyone can play. "Want to turn air guitar into reality? 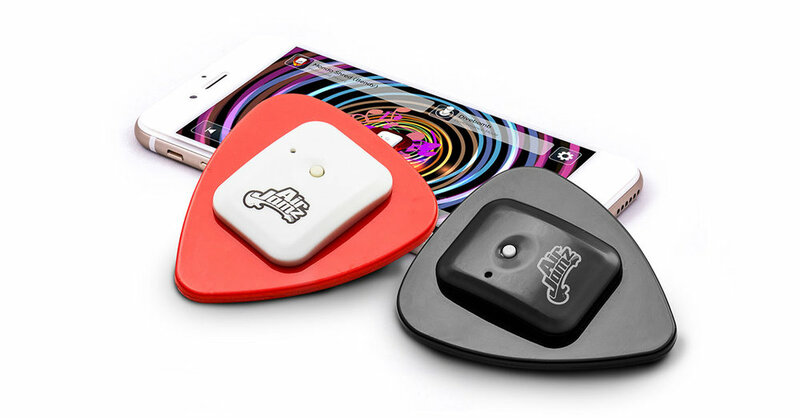 AirJamz is a device you pair with your smartphone, and it'll turn your moves into music. "Want to encourage active play and an appreciate for music? The AirJamz toy is an awesome gift for kids who like to perform." "Imagine Guitar Hero boiled down into a $50 [product] with an accelerometer and an app that "plays" guitar if you strum along..and you've basically got it."